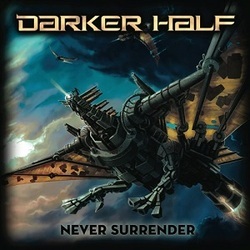 Darker Half have officially cast off the shackles of their thrash genre tag that they have been stuck with on the first two albums. This may upset a few thrash purists out there but I really don't think they ever really were full on thrash as they have always had a lot of melody in their tracks, they just have chosen to really feature that going forward. I would say if anything they were always a powerthrash hybrid. The heaviness is still there in spades, don't you worry about that! This album features a mess of earlier tracks reworked and reconfigured to a more full sound such as Duality, Heads Are Gonna Roll, Lost In Space and As Darkness Fades among others, which I think moves them up several notches as a band. The sound is richer and definitely it works better with Vo Simpson's vocals here. I have a feeling that this is just the tip of the iceberg and moving forward we are going to see some pretty magnificent things coming from this outstanding and underrated band. Coming off a sizeable US Tour, the boys in Darker Half have gained some valuable experiences which should hopefully translate when they start to work on new music. With tracks such as Nemeis, Never Surrender, Blinded By Darkness and killer reworked tracks such as End Of The Line under their belt they are already well on their way to boldly forge their new pathway. These Australians are definitely on the right path! !